Samsung Note tablets feel quite at home in Barcelona. Last year the company tried to steal the spotlight with the Galaxy Note 10.1 and it's now the smaller version's turn to try its hand. 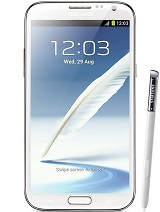 The Galaxy Note 8.0 sits comfortably between the large Galaxy Note 10.1 and the more pocket-friendly Galaxy Note II. It seems to get the best from both worlds - an earpiece and a microphone from the Note II and the slightly higher resolution and more comfortable S Pen from the Galaxy Note 10.1. The Samsung Galaxy Note 8.0 is also a stylish slate, although we have to admit we are starting to get bored with the design. The good news is the tablet is light, reasonably easy to handle and packs a display, which may not be the best we've seen, is more than reasonable for its class. The Mali-400MP4 GPU is certainly capable of handling higher resolution though, and it's a pity Samsung didn't take that chance to gain an even bigger advantage over its competitors. Undoubtedly, the array of software features is a key selling point, but save for the special reading mode, they have all been around for quite some time, so they won't make many Samsung users consider an upgrade. 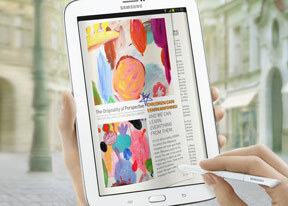 Some will probably find Samsung's latest tablet interesting, but we're not convinced many people will favor it over the Galaxy Note II. Yes, the Galaxy Note 8.0 has more than twice the screen surface, but that's just about all it puts to the table. There's no resolution upgrade to maintain the pixel density and pocketability is certainly worse than it is on the 5.5" phablet. On the other hand, those that need the S Pen functionality and find the larger screens more productive will certainly prefer the Samsung Galaxy Note 10.1. Unless the pricing (which Samsung stubbornly refuses to disclose) is a nice surprise, the Galaxy Note 8.0 might find it hard to carve a niche for itself. So, Samsung will have to try and deliver the Galaxy Note 8.0 to the market at a price point close to that of the Apple iPad Mini. While the compact iOS slate has a headstart, the Galaxy Note 8.0 won't be doomed in this battle as it offers a more feature-rich platform, and the extra benefit of the S-Pen. With its all plastic build, the Galaxy Note 8.0 doesn't hold a candle to the aluminum-clad iPad Mini, but it offers a display of higher pixel density and a more usable screen aspect. We'll know more about the Samsung Galaxy Note 8.0 over the coming months as the tablet gets ready to hit markets around the globe. The compact Nature UX tablet certainly has otential, but it's still in for a tough ride and if Samsung are to make it a success, they have to play their marketing and pricing cards right.